Amusing tricks can easily be performed with sheets of paper if you know how to fold and cut or tear to obtain intricate and unusual patterns. Soldier hats and headpieces of other styles as well as the Jacob’s ladder can be speedily produced. ALL you require in the way of equipment is a sheet of paper. All you need to do is fold it several times, here and there; tear it, so and so . 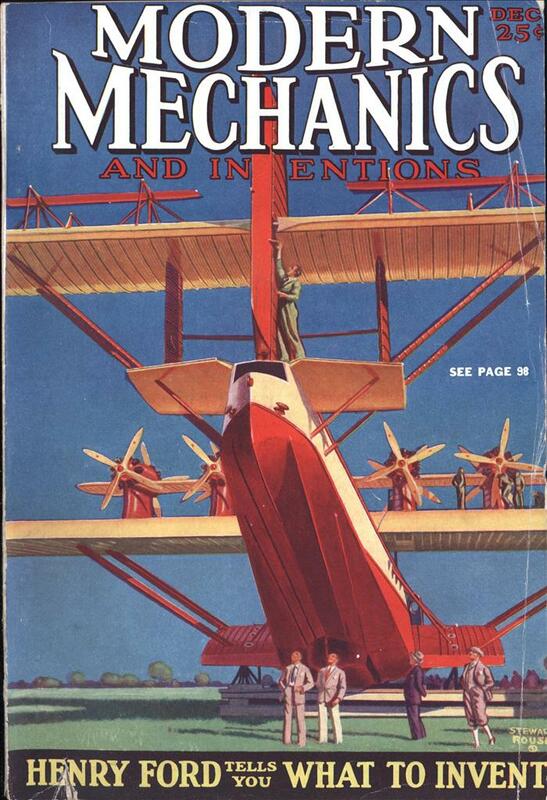 . . and there you are with a clever paper hat, a mariner’s wheel, a paper ladder or some other clever little knick-knack of entertainment or utility. Believe it or not, there’s real fun in these tricks and twists with a sheet of paper. Among paper conjuring tricks, perhaps the most amusing is the “Passport” effect. Briefly, the thing is this: The performer takes an oblong piece of paper, about 4 inches by 8 inches, and folds it as shown by the dotted line in Diagram A of Illustration 1. He then folds it again, as shown by the dotted line in Diagram B, and again as shown by the dotted line in Diagram C.
The paper at this stage is shown in Diagram D. A final fold, creasing along the dotted line No. 1, and bringing the edge of the paper to the dotted line No. 2, will result in a piece of paper like the one pictured in Diagram E. This is then torn or cut down the dotted line as indicated. The result is an odd combination. 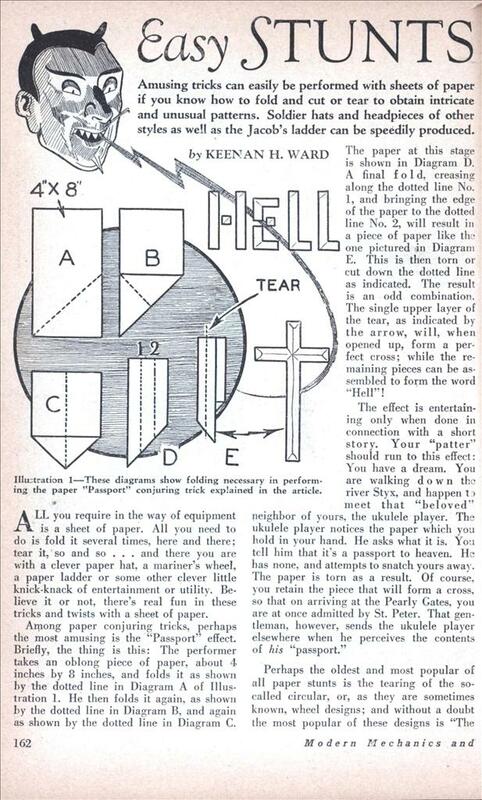 The single upper layer of the tear, as indicated by the arrow, will, when opened up, form a perfect cross; while the remaining pieces can be assembled to form the word “Hell”! Perhaps the oldest and most popular of all paper stunts is the tearing of the so-called circular, or, as they are sometimes known, wheel designs; and without a doubt the most popular of these designs is “The shown by the Diagrams B, C, and D. producing a piece of paper shaped like Diagram E. Now, hold the paper firmly and tear away the shaded portion of Diagram E. The white portion of the design, when opened up, will give the very pleasing mariner’s wheel pictured in the photograph. Other designs can be worked up as suits your fancy, as almost any haphazard design produced symmetrically around a circle produces a pleasing figure. The size of the paper can be varied to suit. For close work, a sheet of paper 21 inches square will give a good effect, while on the stage, performers often use sheets 8 or 9 feet square. When folded four times, as has been described, a figure torn on either edge will appear eight times repeated in a circle when the paper is unfolded. By making another fold, the number of figures will be doubled, and the proportions will increase accordingly with every additional fold. No entertainment with paper is really complete without “Jacob’s Ladder,” and besides being an entertaining stunt, it is one of the easiest effects in paper magic. Do it like this: Take about 10 feet of ordinary wrapping paper, 18 inches wide, and fold a hem about % inch wide at one end of the paper. Then, beginning with this hem roll the paper up into a loose tube, leaving an open core of about 2 inches. When the roll is completed, slip a lubber band over each end to prevent it from unrolling. Flatten out the paper tube, and cut or tear out the center portion, as shown in Diagram A of Illustration 3, and then bend the ends downwards, as shown in Diagram B. The ladder is developed by holding the two ends in the left hand and pulling out the hem with the right. This unfolds the inner coils; and they should then be worked up, first one side and then the other, until the full ladder is developed, as pictured in the photograph. Many performers use various colored sheets of paper pasted together in this effect, and the result is quite pleasing. The size is immaterial . . . four feet or a veritable “ladder to heaven” . . . it’s yours to command. Another excellent trick with paper is the “Color Pocket.” To make this, take a piece of stiff paper, about 6 inches square, and fold each of the four corners to the center, as indicated by the dotted lines in Figure 1 of Illustration 4. Then, turn the paper over and again fold the four corners to the center, producing a piece of paper like the one shown in Figure 2. Color the four triangles, A, A, A, A of Figure 2 with black paint, and, when dry, fold the paper in half to form Figure 3. Now, pinch the ends A, A, of Figure 3 and press them towards the center, forcing the sides B, B outwards so that the paper will form itself into the four-sided, diamond-shaped figure shown in Figure 4. You will find that there are four small pockets in the back of the completed fold. These should be opened up, and the thumb, and first, second and third fingers of the right hand inserted into them. The whole effect is simply this: You show a paper pocket which is colored white. And then—Presto!—the pocket is colored black. The mode of doing this will be easily apparent if you take an actual model in your hand. By separating the fingers, either up or down, or across, you can open up the diamond-shaped figure to show either black or white as you desire. Did you ever have some militant youngster rush up to you, all breathless, and demand with alert expectancy, “Make me a sojer’s hat?” And could you do it? Well, here’s the how. It’s not the old paper hat that was worn ten years ago, but something decidedly different, with two perky cockades projecting from either side. For another little paper stunt, take a strip of white tissue paper 1 inch wide by about 33 inches long and tie a single overhand knot in the paper about 15 inches from one end. This knot should be crushed flat. After making the knot, fold and twist the short end of the strip about the knot to form the head of a paper man. After considerable practice a presentable paper mail can be made and a soft lead pencil can be used for sketching details of the head. If you are somewhat of an artist, you can make this sketch very elaborate—an Abdel Krim, with beard, fierce eyes and a hooked nose—but if not, then simple straight lines for eyes, nose and mouth will serve the purpose quite nicely. The whole effect is absurdly simple, yet it should be practiced thoroughly so that you can make the necessary folds and twists. In virtually all paper stunts crayons or water colors can be used to advantage in elaborating on the simple forms. The Jacobs Ladder can be given a different shade for every rung. The Mariner’s Wheel spokes can be colored with nice effect. Excellent coloring can be done on soldier’s hats and in keeping with the modern trend such hats can be given a futuristic or camouflage color design that greatly adds to the attractiveness of the finished article. The experimenter can derive a great deal of fun and decidedly entertaining paper stunts after he has made the articles described in this article. The person who becomes proficient in performing these tricks will find that it is rather easy but intriguing to fashion boats, following somewhat along the lines used in making paper soldier hats. One of the most fascinating of amateur stunts with paper is based on the folding indicated in the making of the “Mariner’s Wheel.” Many other intricate designs can be made. A Latin cross next to the Devil. Oh well it takes all kinds….